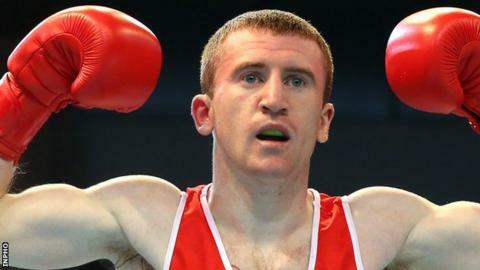 Belfast boxer Paddy Barnes will defend his Commonwealth Games title in Glasgow this summer after his selection was announced on Thursday night. Northern Ireland topped the medal table in boxing in Delhi four years ago with three gold and two silver. Barnes and fellow Olympic bronze medal winner Michael Conlan were among the first group of NI competitors whose Glasgow selection has been confirmed. Others named included shooting's David Calvert and squash star Madeline Perry. Calvert will be attending his 10th Commonwealth Games, having first competed in in Edmonton in 1978. He is Northern Ireland's most successful competitor with four gold and four bronze medals in the Full Bore Rifle singles and pairs events. Calvert's first bronze came at his second Games in Brisbane 1982 and his last in Delhi four years ago. His gold medals were won in Victoria (1994), Kuala Lumpur (1998) and two in Manchester in 2002. Meanwhile, David Beattie will go to Glasgow hoping to add to the silver medal he won in the Men's Trap in Melbourne in 2006. Madeline Perry will be competing in her fifth Games, having made her debut in Kuala Lumpur in 1998. The Banbridge woman was beaten in the quarter-finals in 2006 and 2010. She is currently ranked eighth in the world, having reached as high as third in 2011. Northern Ireland have also announced competitors from judo and bowls who will be in action in Glasgow. Lisa Kearney, who competed at London 2012, will be looking to emulate her one-time coach Lisa Bradley who won silver for NI in Manchester in 2002. Bowler Donna McCloy will be competing in her fourth Commonwealth Games. Women's boxing in included in the Commonwealth Games for the first time and Northern Ireland will be represented by Michaela Walsh and Alanna Murphy. The Games run from 23 July to 3 August. Paddy Barnes (49kg), Michaela Walsh (51kg), Ruairi Dalton (52kg), Michael Conlan (56kg), Sean McComb or Joe Fitzpatrick (60kg), Alanna Murphy (60kg), Sean Duffy (64kg), Steven Donnelly (69kg), Connor Coyle (75kg),Padraig McCrory or Sean McGlinchy (81kg), Steven Ward (91kg). Lisa Kearney (-52kg), Caoimhin Thompson (-73kg), Eoin Fleming (-73kg), Gavin McNeill (+100kg), Kirsty Kee (-63kg), Mark Montgomery (-100kg). Barbara Cameron, Mandy Cunningham, Donna McCloy, Jennifer Dowds, Catherine McMillen. David Calvert, Gary Duff, Kirsty Barr, Jack Alexander, Samuel Kelly, David Christie, David Beattie, David Henning, Louise Aiken, Claudia McClung, Clement Buchanan.